All live apprenticeship opportunities with our employers are advertised via the "Find an Apprenticeship" service. Please register for updates and to apply. We do have employers who are always interested in good candidates, so please Send us your up to date CV to introduce yourself to us! Great news for CITB-registered employers who could see up to a 30% increase in grants they can claim for employing an apprentice, with as much as £14,500 being available for an apprentice who completes both Level 2 and Level 3 apprenticeship across a 3 year period. The new grant rates came into force on the 1st April and apply to apprentices who started after this date. For more information on the grants system and how to claim, please see here. We very much welcome this news, as it further incentivises the recruitment and training of apprentices who are greatly needed within our industry. A quick reminder that any employer wishing to claim CITB grants will need to set up an online account. This makes it easier to do, and employers who pay CITB levy can also manage their payments online too. Setting up an account is easy and there is useful guidance and also an online chat facility as well as the helpline. Check out the link for more info HERE. Lovely work by students from Gosford Hill school in Kidlington, today in our workshop. We welcome the announcement in today’s Autumn Budget of a further increase in the Minimum Wage rates for apprentices. The new minimum level will be £3.90 per hour from April 2019 and applies those aged 16-18 and those aged 19+ in the first year of their apprenticeship. Anything that puts more pounds in apprentices’ pockets is ok by us!! We also like the news that employer contributions towards apprenticeship training is to be cut from 10% to 5%. This will be welcomed by the employers that we work with, for sure. A new report into how the construction industry must develop and harness digital technologies needed to adapt to change and ensure it can deliver growth and quality needed in the future. Read it in full here. 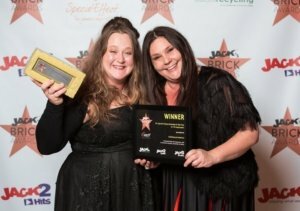 We were ever so proud of the success of number of our employers at the recent JACKfm Brick Awards which took place at the Bodleian Library in Oxford. We are known for our award-winning apprentices so it is now fantastic to have the success of some of our employers recognised in this way. Not an easy decision to make, they are all brilliant but the award was given to the fine folk at Cottonwood. 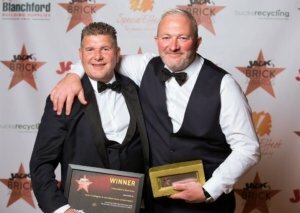 There was consolation for Leon Construction though as Ted Owen and Leon O’Callaghan won the ‘Best Boss’ award. A brilliant achievement, and we are sure all the apprentices they’ve trained up would agree. Find out more about some of them here. We are also remarkably proud of Max Berry from Paul Tew Construction Ltd for being a worthy finalist in the Apprentice of the Year category, sponsored by Anglia Tool Centre. Pics from a very exciting evening here. Well done to all finalists! According to this article, the government is to review the apprenticeship levy to try to stimulate growth in apprenticeship starts including in the construction sector where starts have fallen by more than 10% since its introduction. This includes increasing the amount of levy-funds that can be transferred by an employer to other companies, from the current 10% to 25% from April 2019. Also significant is the commitment to accelerating the development and introduction of new Apprenticeship Standards and switching off of all existing Frameworks by August 2020. Quick reminder to all students and apprentices that there are NO lessons this week due to our Easter break. See you all next week and enjoy the rest!